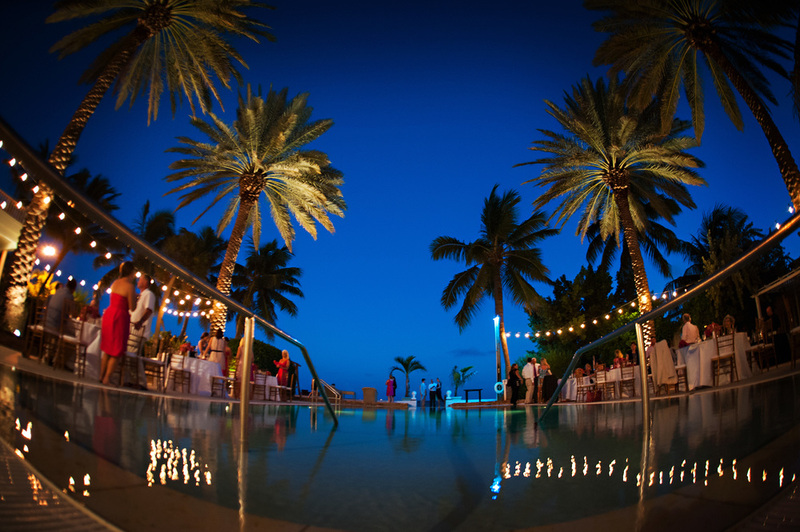 Let's talk string lighting for your Key West wedding... We know you've put a lot of time into planning the most beautiful day of your life, and now it's time for everyone to see the wonderful decor you've created! String lighting is not only an elegant touch to brighten your space, but it offers the perfect amount of light to create safety for your guests. All of our lights are equipped with dimmer switches so it's never too bright or dark. We can dial in the perfect amount of light, helping you achieve a different ambiance throughout the evening. White or black light strands (cords)? As you begin your research, you may notice companies offering either white or black colored light strands. While white may match the soft colors of a wedding, those strands will continue to be seen once the sun goes down, and that may not be the look you are going for. In our professional opinion, string lights are meant to look like they are suspended from the sky, giving you more of a twinkle effect like a star in the sky. Because our light strands are black, they become almost invisible at nightfall. They don't create a ceiling effect, and they can also be set up for lanterns if that is an upgrade you choose. My team can help you create the exact look you are going for, as well as make the planning process simple by providing more than just lighting! We are a full production team offering DJ service as well as a photo booth. Feel free to call me personally and let's turn your vision into a reality! Every wedding in Key West this November has had the most perfect weather I've ever witnessed. Cool breeze, countless stars in the sky, and this one in particular was complemented with a full moon. 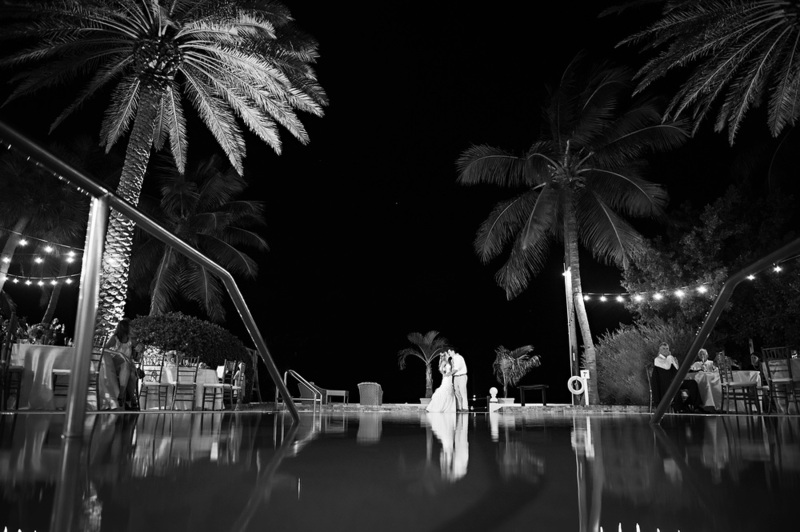 Chete and Doug had their wedding on the beach at the Casa Marina, which always hosts a picture-perfect setting. Dancing under the palm trees and walking around in the sand really creates a novel atmosphere that everyone enjoys. 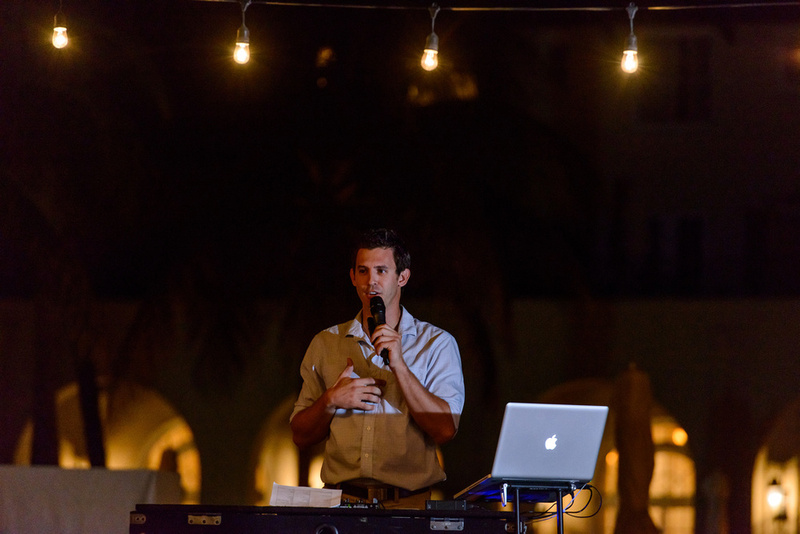 The wedding was planned very well by Jenn and Danielle from We've Got the Keys, and the dinner menu was nothing short of extraordinary, thanks to the staff at Casa Marina and their in-house planner, Reina. Mary Veal Photography did a wonderful job of capturing all the precious moments, and they also hired White Orchid Studios to help create their one-of-a-kind wedding video. It's always great to work with such an all-star team! Chete and Doug, if you are reading this, thank you so much for letting me a part of such a special moment in your life. You two were awesome to work with! Congratulations! I was the DJ for their ceremony, cocktail hour, as well as the reception, and was also contracted to do string lighting. My job never gets old. Everyone was having a great time dancing and sharing memories, and I always love being a part of that interaction. Great Events Catering put out an amazing display, as always, cooking up nothing but the best menu with the freshest ingredients. Did you know that these guys bring out a kabob grill as part of their presentation?! Now that's first class! It was also the elegant flower arrangements done by Love In Bloom that created a nice focal point at each table, while providing a very nice bride bouquet that added great colors to Kylie's dress. A Modern Romance was the wedding planner and everything stayed nice and organized. As the sun began to set, it was then that our string lighting really started to pop. This job we did is our newest design at the Southernmost Mansion, and I think it really brings out the hard lines of the property. It's not too much, where it becomes overpowering in pictures, but gives just enough light for people to see as their walking around (very important), and having it along the side of the pool creates an amazing reflection in the water that makes for beautiful pictures. Now that we've done away with stringing the lights across the pool, it has opened up the amazing architecture of the house in all the photos. I think the photos below speak for themselves, as Limelight Photography did a wonderful job in capturing priceless moments throughout the night. Another flawless wedding night in Key West and a big congratulations goes out to the wonderful couple, Kylie + Kevin! 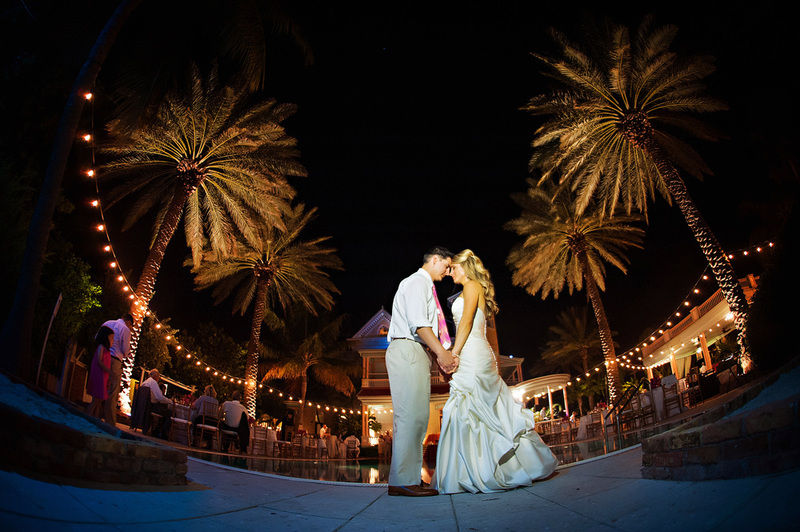 Another picture-perfect wedding night at the Casa Marina, Key West! Beach weddings are one of my favorite ways to celebrate such a wonderful night and with the way Erin + Kurt decorated, you couldn't ask for something more beautiful. An intimate wedding of around 50 people, everyone shared some great times together in the photo booth, and it was a huge hit with the children. I love how our photo booth really brings out everyone's inner goofiness, and because it's an open-air style, you can fit a ton of people in one shot have create an awesome family photo! It also helps when you have a great staff that can assist everyone with the props and have the best scrapbooker in all of the Florida Keys! We want your scrapbook to set on your coffee table for years to come, so we make sure you get nothing but the best! The music they requested was a lot of fun too and there wasn't a moment that the dance floor was empty. Even through dinner people were eager to dance and that's what really makes my job awesome. That feeling of helping a couple create a wonderful night with their friends and family is something I just cannot describe, and that is why this is truly my passion. The wedding coordination was fabulously done by Peggy Russell from Destination Wedding Studios and Carnia from the Casa Marina did a wonderful job creating impeccable service. Milan Event Floral & Decor did a beautiful job with their flower arrangements, as usual, and John Hunter from JHunter Photography was really working hard finding the best shots all throughout the night. It was truly an all-star team of professionals, and that's what it really takes to create a flawless night. It was my absolute pleasure to work with such a great couple! Congratulations, Erin + Kurt! It's really great when I get an inquiry and the first thing the couple says is that music is there number one priority. When you think about it, your DJ can really make or break your wedding within minutes, and it's important to think that way. They ended up booking me right away and they were very pleasant to work with during the entire planning process. A week before the wedding, we set up a meeting to go over their worksheets and Diana said that they had hired the junkanoo band I referred to them! What!?!?! Man, I love it when a junkanoo band comes to make an appearance at a wedding! Everyone had such a great time dancing with the junkanoos and what a great way to bring in some Key West culture to a wedding! Diane + Blake also hired me to set up the celebrity lighting package at the Reach, which included full inside and outside uplighting and a custom made monogram to project onto the terrace wall. Talk about a unique way decorate your wedding. The lights were set to aqua/teal to match their beach decor and really made her pictures pop. The music they requested was great, and I was asked to play some latin tracks too which I always enjoy doing. Overall, the night was a complete success and they were very pleased with everything!